Thank you to Better Border Biosecurity (B3) for hosting this important conference. The theme is “10 years on – Adding Value to New Zealand’s Plant Biosecurity System through Research”. Today I want to talk to you about the importance of biosecurity to New Zealand, and the importance of scientific research to back it up. I want to start by acknowledging the B3 partnership as a great model for working together on research. The signed up partners include four Crown Research Institutes (CRI), a university based research entity, three government agencies, and an industry group. It’s important that it involves end-users from both government and industry. Everyone here has probably heard me say many times that “biosecurity is my number one priority as Minister.” Today I want to say a few words to remind why that is, and why this agreement today is so important. The primary sector is the powerhouse of New Zealand’s economy, accounting for over 70 percent of our export earnings. It helps pay the bills for our schools, hospitals and social services, and supports many jobs in our regions and cities. . .
ANZ Bank economist Con Williams says many people are overlooking the huge improvements in productivity dairy farmers have achieved recently. Fonterra on Wednesday set next season’s initial forecast farmgate milk price at $7 per kilo of milk solids, which was higher than some had expected. However, the dairy giant has cut this season’s forecast payout by 25 cents to $8.40 per kilo of milk solids. That would reduce farmers’ incomes by nearly $400 million but Mr said it represented just a little less cream from what was still a record payout. The average annual yield per cow was close to 381kg of milk solids – a new record and about 7.5 percent ahead of trend. . .
National Fieldays seminar host Niwa is taking its science directly to farmers to optimise water use and lessen the negative impacts of dairy effluent. National Institute of Water and Atmospheric Research’s chief scientist, environmental information, Jochen Schmidt, said the organisation has moved its focus to the one-on-one farmer level gradually over the past five years. “This is definitely an area that we’re strategically pushing at the moment. The minister [Science and Innovation Minister Steven Joyce] is our shareholder and that’s what he told us because the growth agenda is out there and we want to ensure our primary sector is growing while sustainably managing the environment. . .
DairyNZ is running 19 StockSense events in June and July to help farmers prepare for the calving season. The events are split into two workshops – one for junior staff and one for senior staff – with each workshop focusing on developing skills to help the calving season go well and reduce stress. Humane slaughter on-farm and udder health will be the focus of the senior level workshop. DairyNZ’s animal husbandry and welfare team manager, Chris Leach, says the humane slaughter topic is particularly timely due to the expected change in the animal welfare code and the implications for farmers. “Farmers need to understand what’s expected of them,” says Chris. The senior workshop will also focus on actions owners and managers can take to reduce stress for themselves and their teams, to help calving go smoothly. “The workshop will provide tips and tricks to stay healthy during the busy period. Being prepared and staying healthy eases stress and will make for an easier spring,” says Chris. . .
Primary Industries Minister Nathan Guy has welcomed the findings of an independent report into the Primary Growth Partnership (PGP), which estimates it will add $6.4 billion per annum to New Zealand’s economy by 2025. “The NZIER report further concludes that the PGP has the potential to achieve an additional $4.7 billion per annum by 2025 if all the R&D is successful, the aspirational stretch of PGP programmes is achieved, and the innovations are widely uptaken. “This would add up to $11.1 billion per annum to New Zealand’s economy by 2025. “The PGP is about supporting innovation in the primary industries, which are the backbone of New Zealand’s economy – accounting for over 70% of our merchandise exports. There are currently 18 announced programmes jointly funded by industry and government.” . .
Ballyhooley Beef has done it again – winning best retail brand with the Murray Grey meat at the Steak of Origin competition last week in Feilding. But this year, Winton farmer Barry Macdonald and his beef have done one better, as his steak was chosen as the tastiest by the public, also winning the people’s choice award. In what was a first for the competition, Mr Macdonald’s steak was put up against the other 19 finalists to see which the public liked best. . . Sorry ladies, it’s official – 2013 Fieldays Rural Bachelor of the Year Simon Washer is now spoken for. However, a whole new group of eligible young men are set to strut their stuff at the NZ National Agricultural Fieldays in June. Washer only entered the competition by default as his fellow members of the local young farmers’ club balked at the idea of entering. “I was the chairman of the club at the time the entry form came through and when I asked the guys if anyone was interested in entering, they all gave me a dirty look, pointed the finger at me and then nominated me so I didn’t really have much of a choice. . . . In the past 10 years to June 30, 2013, agricultural debt has risen mostly due to the dairy sector where lending has almost tripled to $32.4 billion. The surge in lending to the dairy industry far exceeds the $1.4 billion debt owed by sheep farmers and $1.2 billion accrued by beef cattle farmers, according to Reserve Bank figures. Dairy sector lending has soared as farmers have invested in converting land to dairy farming to take advantage of high milk prices and the associated strong growth in farm land prices, the central bank said in its last Financial Stability report in November. Indebted dairy farmers will be weighing up using high dairy payouts to pay down debt or increase farm investment in anticipation of a positive outlook, it said. Since then, the bank has begun to raise interest rates, hiking the benchmark twice in as many months, and milk prices have weakened in response to increased production. . . Ask Duncan Smith why he has stuck with the Perendale breed and the answer is succinct. ”They are just so tough and they just don’t die,” Mr Smith, who farms Islay Downs, on the Pigroot, said. Mr Smith and his wife Claire are among the four entrants in the Sir Geoffrey Peren Cup competition, judged on farm last month and held in conjunction with Perendale New Zealand’s national conference in Otago this week. The winner will be announced during the conference. It was Mr Smith’s late father, Ross, who took up the Perendale breed in the late 1970s. He was a ”very staunch Perendale man”. . .
More than 60 registrations from throughout New Zealand have been received for Perendale New Zealand’s national conference in Otago this week. Planning for the annual event, which alternates between the North and South islands, began nearly a year ago. The conference begins on Thursday with registrations and a dinner. On Friday, there is a bus tour to South Otago, visiting the Mitchell family’s Hillcrest stud at Clinton, and the Gardner family’s stud near Balclutha. There will also be a visit to AgResearch’s Invermay research centre, and to the Elders woolstore to view a wool competition. . . . Farmers grazing stock this season can keep track of their animals by ensuring their NAIT records are up to date. 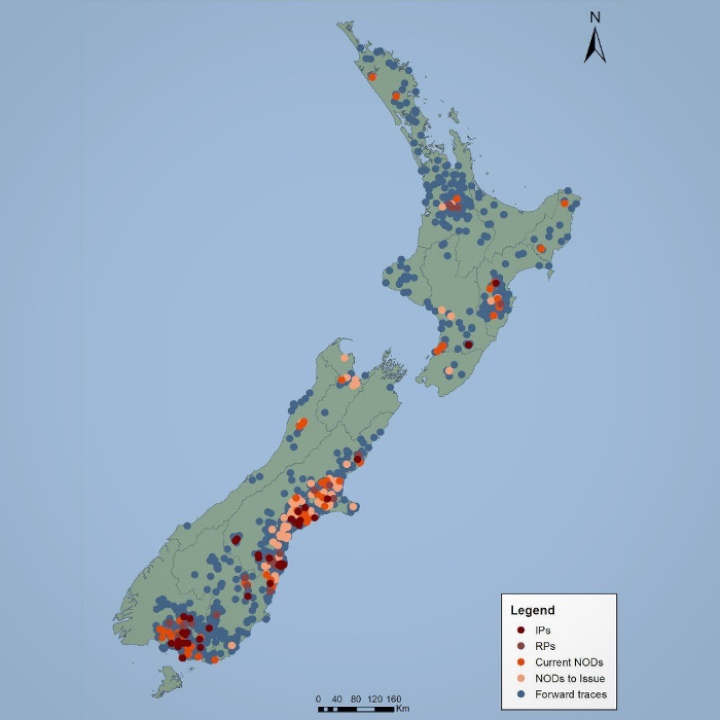 “It’s important to record all off-farm movements of stock to grazing blocks and confirm with NAIT when the animals arrive back on your property,” said Dr Stu Hutchings, OSPRI New Zealand Group Manager, Programme Design and Farm Operations. “NAIT tags provide a unique identification number for each animal, which can help farmers verify that the same animals they sent for grazing are the ones they are getting back.” . . .
A study of rat poisoning in small forest blocks has shown that pest control on a small-scale can still provide a huge boost to native bird populations. The six year study was carried out by Massey University researchers who analysed the effects of rat control in 19 blocks near Bennydale in the King Country. It showed that small-scale control increased the number of North Island robins by 50 percent on average each year and also helped other species favoured by rats . . .
Federated Farmers has developed a New Employers Pack to help first time employers meet their employment obligations and develop better working relationships on farm. “We want all employers to be able to put their best foot forward and this pack allows them to do that,” says Katie Milne, Federated Farmers Employment Spokesperson. “The New Employers Pack is in response to an overwhelming demand for it from our members. In a member survey 97 percent wanted an employment pack produced. So Federated Farmers has created one, which helps farmers get it right from the very start, and that ticks all the boxes. “As a farmer myself, I know farmers would prefer to know they are doing it right and understand what is required of them. This pack is designed for all farm types so I know all farmers will jump at this innovative employment pack. . . . Rural Equities, the farming group controlled by the Cushing family, has lifted its stake in Tandou after taking up its entitlement in the ASX-listed agribusiness’s three-for-eight rights offer. Entities associated with Rural Equities now hold 21 percent, up from the 17.7 percent owned in August. Tandou’s offer at 47 Australian cents a share closed on April 28. Shareholders subscribed for about A$13.5 million of the A$25.2 million sought. Underwriter Petra Capital made up the shortfall of about A$11.7 million, placing the stock with institutions and professional investors. Tandou shares last traded at 46.5 Australian cents on the ASX and have gained about 12 percent in the past year. They are rated a ‘strong buy’ based on two analysts polled by Reuters. . . .
A prime opportunity for new players to enter the breeding game and for existing breeders to expand their portfolio is presented by New Zealand Bloodstock’s National Broodmare Sale, next week (13 May) at Karaka. There are 209 broodmares catalogued for sale by leading damsires from New Zealand, Australia and further afield, in foal to proven and exciting young sires. One of the highlights of the Sale will be the 12 broodmare entries by legendary sire Zabeel. The recently retired Cambridge Stud stallion is the damsire of 24 individual Group 1 winners including Dundeel (High Chaparral), Atlantic Jewel (Fastnet Rock),Silent Achiever (O’Reilly), Go Indy Go(Bernardini) and O’Marilyn (O’Reilly) this season. . . .